However, following the much publicised shutdown of Megaupload, keen file sharers may find it trickier to download music files (aside from using the hundred or so copycat sites of course…). 1. Do make sure the tape you are using to record Bow Wow Wow‘s latest smash hit does not contain your mum’s prized recording of Terry Wogan‘s last breakfast show (first time around) or (worse) one of your dad’s Goon Shows that he recorded in 1967 and is probably the last known copy after the BBC wiped over the original recordings in the seventies. The defence of “if you wanted to keep it you should have pressed the tabs out” is ineffective, especially if they did, but you put Sellotape over the gap so it would record after all. 2. Do try not to lose concentration when taping. Finding out half an hour later that you have been “pausing” when you thought you were “taping” and vice versa can be extremely frustrating. NB this may be preferable if the songs you missed were by Wham!, Phil Collins or The Mighty Wah. 3. Do have lightning reflexes and the supernatural ability to anticipate when Tommy Vance is about to talk over the ending so as to make your tape as authentic as possible. 4. Don’t keep trying to update the track listing on the same insert in ever smaller letters when you tape over something. The crossings out look messy and you’ll probably never read the track listing anyway. 5. Do forget about noting the tape counter number next to the start of each track. You have probably forgotten to set it to zero before starting, and only people who file their record collection in alphabetical order write the number down, and you’re not like that are you…? 6. Don’t try to record a new song halfway through a mix tape just because you have got tired of the one you are recording over. The new song will always be ten seconds longer than the one being replaced (this phenomenon is known as Vance’s Law). Just use the skip button if you tire of a song. Oh, hang on – they haven’t been invented yet have they? 7. Don’t worry if you mess up or cut off the ending of a particular song. There’s always next week’s show. Unless they skip that tune next week. (This will always happen). 8. Don’t imagine in your head that Tommy Vance is deliberately trying to catch you out by talking over the record two seconds before you press pause. That’ll only make you angry / paranoid. He is, though. And he thinks it’s funny. 9. Do remember that your mum will try to engage you in conversation or call you for tea only when you are recording a song and the song is about to end. Don’t tell your mum to “shut up a minute whilst this song finishes”. It won’t go down well. 10. Don’t play your mixtape at a party- it is for personal use only. Not for copyright reasons: but because nothing screams “cheapskate” at a party more than someone whacking on music that has a Radio 1 DJ’s aborted voice-over at the end of each track. Spent my aunt’s inheritance on a Sony cassette recorder in 1976 that had a quick button to switch over and record on the other side. Following year Elton John played a Silver Jubilee concert on Radio 1 FM stereo which I taped. Lent it to an American who was amazed I only lost half a word of inter-song dialogue at 61 minutes when switching to the other side of the C120, he thought I had bionic hands. 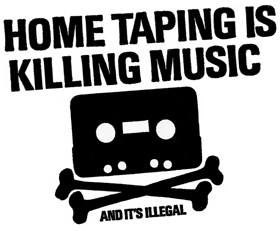 A machine that would continue recording without having to take the tape out? In 1976?! Wow. I wish I’d had one of those…. Ah, a tape counter, that was verging on hi-tech. So true about the replacement song always being ever so slightly longer, even if it’s another attempt to record the same one. I think kids today would be having nervous breakdowns if they had to cope in the predigital world. It’d be fun watching them try though, right? Maybe I’ll get my kids to try to work it out…. Good luck with that. I think they’d say, ‘What’s the point though?’ All that effort with extremely poor results. Heart-attack-inducing segues, strange gaps full of hiss … those were the days. I was guilty of doing this as well, but on reflection it would have been easier to tape the whole show and then lift off the tracks you wanted. Thankfully I’ve managed to acquire the majority of Tommy Vance shows in full over the years and of course the links and jingles are now more interesting than the actual music! You have acquired most of his shows? That’s interesting – you must have some good live recordings (Deep Purple at Knebworth, various other big shows). I wonder if there are some sessions from bands that went on to greater things? Ah, i see. I did a TV show once where i replicated taping off the radio and they had an old mp3 file of the top 40 that they had me tape. (The show came about because if this post, funnily enough). You’re right about the links and jingles being entertaining! I know, I watched & recorded it! It has been repeated a lot since as well!.